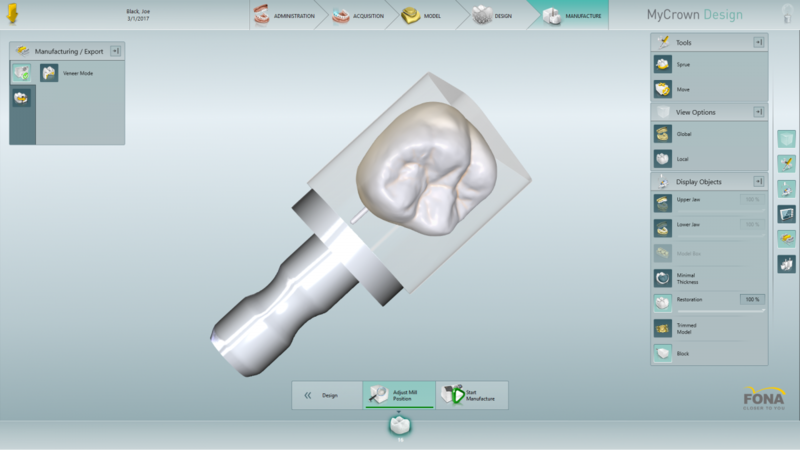 The CAD/CAM system features a fully integrated software guiding you through every step ensuring smooth performance and ease of use. The unit comes with touchscreen monitor and cart on wheels, allowing easy transportation between treatment rooms if needed and easy storage during non-operational times. 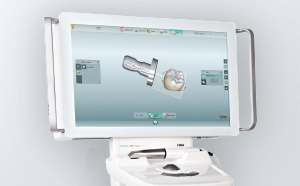 The small and light camera is easy to use and allows comfortable reach of all intraoral areas. The real-time 3D scan is precise and immediately available to view. 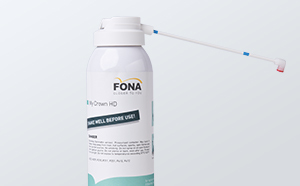 The lightweight design allows simple manipulation and ensures minimal patient discomfort during acquisition while guaranteeing maximum hygiene as it is used with single-use protective sheaths. The camera is preheated thus preventing fogging and ensuring minimal time required for the scan. Immediately ready to use, MyCrown Mill communicates with the software through wireless connection, can serve multiple acquisition units, plugs into the power outlet and requires no air or water line, making it suitable for nearly all working areas. 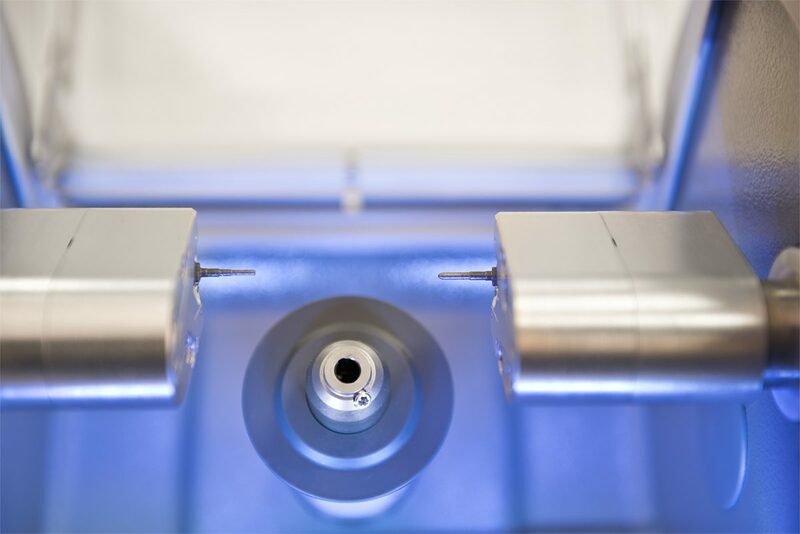 The two-spindle system, with milling and grinding properties, ensures high speed restorations with an average of 12 minutes required to produce a crown. 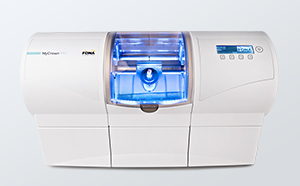 The size of the unit is compact allowing it to fit in every dental office. The full process of restoration is completed in a single appointment thus saving time for both patient and dentist. The intuitive scan and MyCrown design software eliminate the need for conventional impressions, waiting time and further appointments. The state-of-the-art camera scans the area and advanced software produces a design with high accuracy and precision while, at the same time, allowing to make adjustments for a perfect fit. 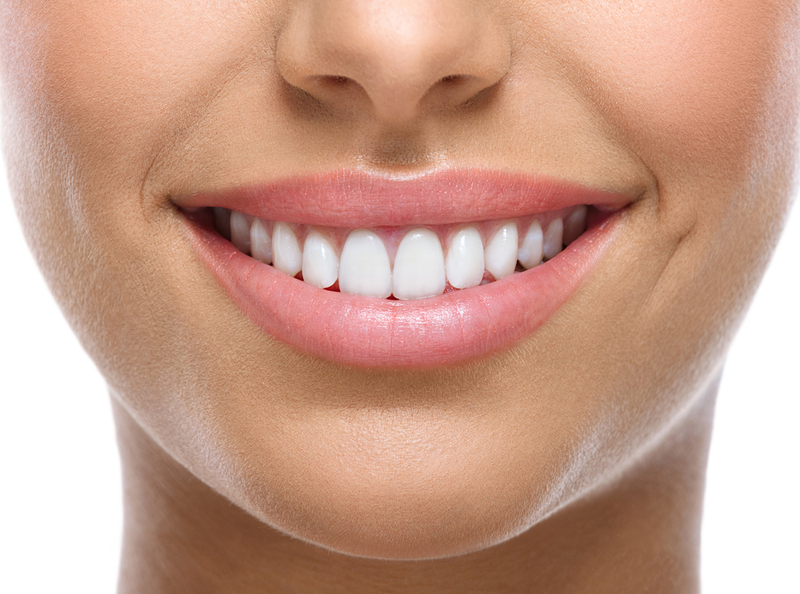 Unlike alternative impression-taking methods the process is efficient and the patient feels minimal discomfort. Scanning the restoration area with the compact camera is smooth and fast. The efficient treatment and lasting results persuade more and more patients to prefer one visit restorations to alternative options. With MyCrown Mill you are not limited to working with a specific manufacturer or material. 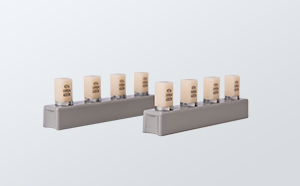 The restoration blocks can be selected to suit your workflow and specific needs. The system allows to export the finished design for future reference and easily share it within the clinic or multiple offices. 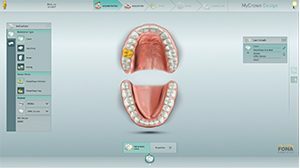 The MyCrown fully integrated CAD/CAM solution is able to create crowns, veneers, inlays, onlays and small bridges in just one visit. Choose the restoration block to be inserted to allow the use of preferred material and customise aesthetics to fit the patient. 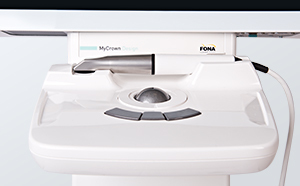 The fully integrated complete system ensures high precision and smooth workflow due to steady communication between the MyCrown Scan, MyCrown Design software and MyCrown Mill. 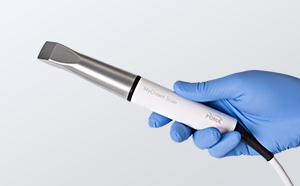 MyCrown HD spray applies a thin layer of black and white particles that are traced and measured to produce a precise model with colour of the restoration without reflections. MyCrown comes with a camera that can be used in 2D and 3D mode. 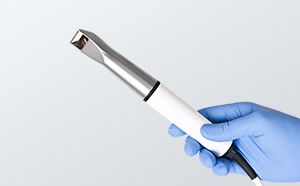 It can be used as a 2D intraoral camera thanks to the built-in colour sensor, improving dentist-patient communication. Switching from 3D scan to 2D photos and videos is done easily, by the click of a button. 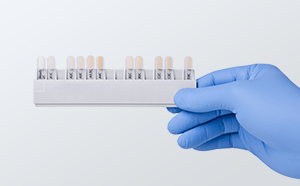 The units are easy to maintain due to minimalist design with recommended use of antibacterial wipes or high level disinfection liquid. The camera is used in combination with single-use hygiene sheaths to protect the dentist and patient. Creating a crown has never been easier with the advanced software guiding you through every step. Once the preparation phase has been completed, MyCrown Design takes you through the steps required to take you to the final – manufacturing – phase. 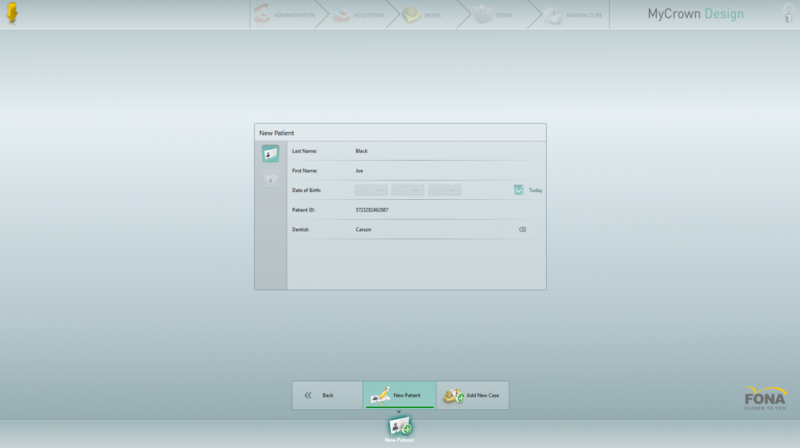 After the patient has been prepared for scan, the first step to your new design is patient creation in the software and filling in basic patient data. The next step is acquisition phase. 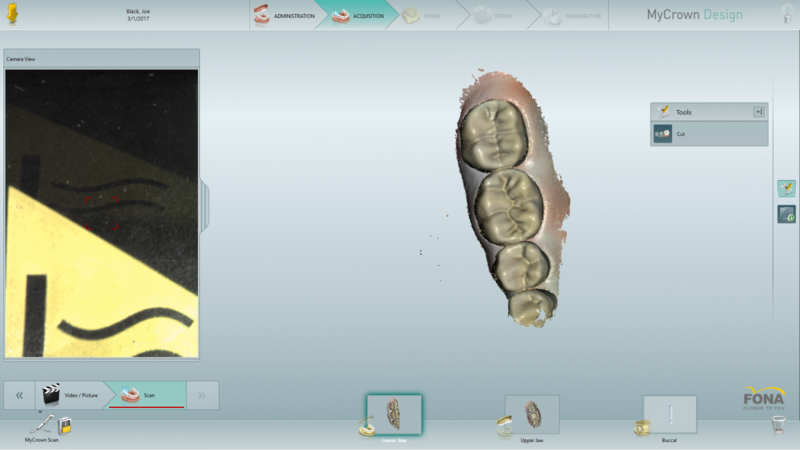 With the help of MyCrown Scan you need to scan just the restoration area and neighbouring teeth. The compact intraoral camera displays the area in real-time on the display in front of you. 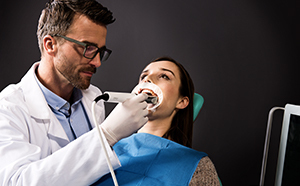 In order to calculate the proportions of the case, a scan of the upper and lower jaw is required, including buccal bite. Once the scan has been completed, you’re taken to the model phase. Here you are guided to indicate the margins of the restoration area and set the axis of restoration insertion. The next stage is design. 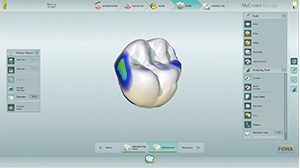 The software already has a fitting proposal with great anatomy respecting the shape of the neighbouring teeth and occlusal contact. 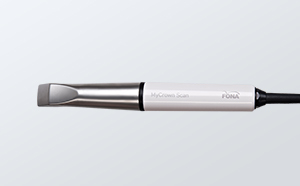 Further tools are available for fine-tuning, such as adjustments of the contact points and anatomic shape of the crown. The final step is the Manufacturing phase. Once you’ve approved your design, all you need to do is simply place the block and mill your restoration, thanks to the fully integrated system. In a few minutes you will be holding a beautiful crown or other needed restoration in your hands, ready to be polished and placed in the restoration area. Your patient will leave with a beautiful smile once again, completed in one visit. 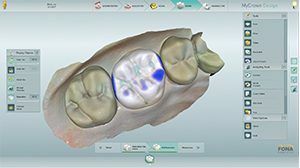 The system comes complete with acquisition unit with 2D and 3D camera, state-of-the-art intuitive software and milling unit. 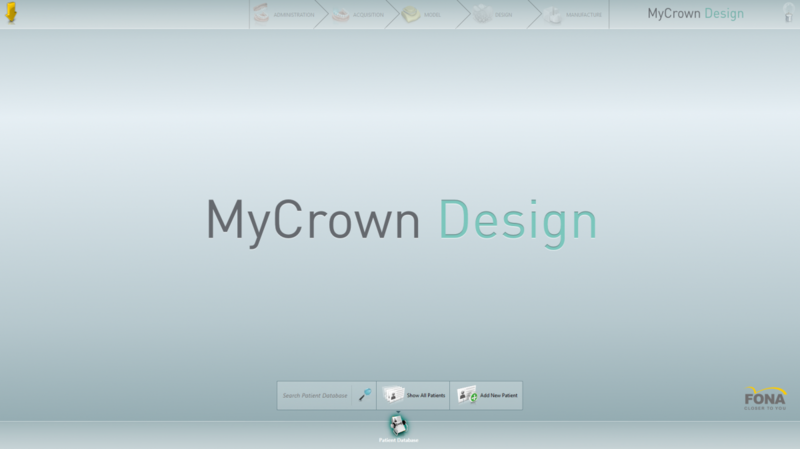 MyCrown Design guides you through each step of the process for easy acquisition, proposal and creation of the desired restoration. The MyCrown Mill with dual spindles completes the process by creating the pre-approved design, ready for use. 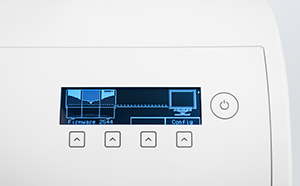 The intuitive guided software ensures fast and easy operation of the unit. 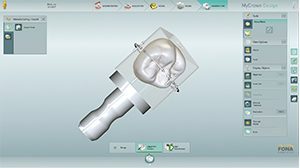 The step-by-step guided process guarantees quick planning and smooth delivery of a beautiful milled crown or other supported restorations. 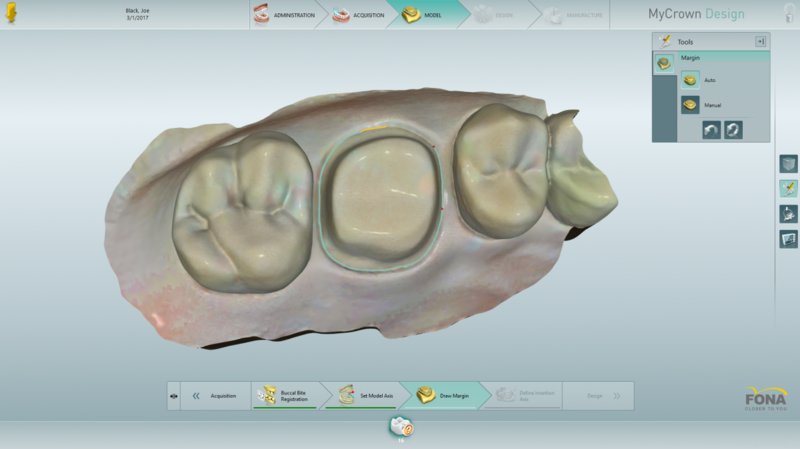 Grow your clinic like never before with MyCrown CAD/CAM system! 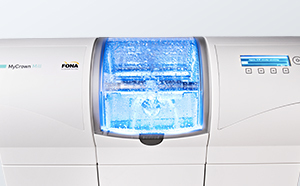 Allowing to create the most common restorations in general dentistry - crowns, veneers, inlays, onlays and small bridges – in one visit it is an excellent solution to take control of your dental practice and invest in new services and equipment.